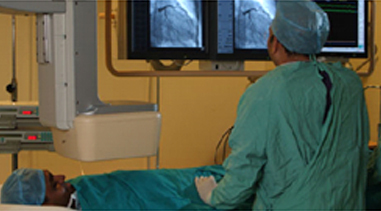 Max Heart & Vascular Institute (MHVI), one of the leading cardiovascular care centres in the country, is a 200 bed state-of-the-art cardiovascular facility located at Saket, in South Delhi. From diagnosis to treatment and recovery, the institute provides a wide array of comprehensive tertiary care through its eminent team of Cardiologists and Cardiovascular surgeons. The hospital is equipped with avant-garde technology, digital flat panel Cath labs and state of the art operation theatres. Apex tertiary level coronary services are provided by on site medical consultants trained to handle acute MI. The institute boasts of preventive care services, advanced diagnostic services including a 64 slice CT scanner and comprehensive nuclear medicine facilities. Cardiology is a branch of medicine which deals with the diagnosis and treatment of heart diseases. Cardiology services at Max Heart & Vascular Institute (MHVI) are designed to deliver total patient care in an ethical and open environment. All the processes are geared to ensure that the patient's care and comfort takes precedence over everything else. MHVI's Cardiothoracic & Vascular Surgery department is a dedicated centre for comprehensive surgical management of diseases of the heart, lungs and blood vessels. Max department of cardiovascular and thoracic surgery is a 24 hour work engine where a committed team of surgeons, nurses and other healthcare professionals provide best care to the patients who come with cardiac and vascular complications. At the Department of Cardiology, we take all steps necessary to ensure that the patient's care and comfort takes precedence over everything else. We aim to deliver total patient care in an ethical and open environment. Patients suspected to have a heart disease or disorder are investigated by cardiologists who take a complete history of the patient's condition and perform a thorough physical examination and non-invasive investigations, nuclear investigations and CT/MRI scans. are a by-product of affluent lifestyle, irresponsible dietary habits, perpetual stress, smoking, excessive tobacco and alcohol consumption. can lead to hypertension and diabetes, which may further lead to coronary artery disease. For reassurance of a healthy heart and complete peace of mind, we offer the following cardiac check-ups: Max Basic Cardiac Check-Up. Max Standard Cardiac Check-Up Max Comprehensive Cardiac Check-Up. A comprehensive lifestyle management programme. Electrical activity of the heart is recorded. Determines whether or not a heart attack has occurred. Shows the part of the heart that may be damaged, an irregular heart beat or rhythm and a decrease in supply of blood or oxygen to the heart. Doppler ultrasound measures the change in frequency of the echoes to calculate how fast an object is moving. This technique is used to measure the rate of blood flow through the heart and major arteries. This technique complements 2-D echocardiography and conventional Doppler techniques by providing colour flow maps that improve the spatial characterisation of disturbances in the flow. Peripheral arterial Doppler examination is performed by measuring blood pressure and Doppler waveforms at multiple levels of the arms or legs. The severity and location of blocked arteries can be approximated by this technique. Peripheral Venous Doppler studies detect blood clots in the leg or arm veins and are done in case of painful or swollen extremities. In patients who are obese or have closely positioned ribs, the physician may select to get a Transesophageal Echo or TEE. TEE offers a much clearer image of the heart, particularly the back structures, such as the left atrium, which may not be seen as well by a standard Echo taken from the front of the heart. A TEE is very useful in detecting blood clots, masses and tumours that are located inside the heart, extent of certain valve problems and helps detect infection of heart valves, certain congenital heart diseases, like a hole between the chambers of the heart and a dissection of the aorta (major artery of the body). This technique is quite useful in evaluating patients who have had minor or major strokes owing to blood clots. Stress Echo and tests include both treadmill and a combination of treadmill and Dobutamine Stress Echocardiography testing. In Echo testing, ultrasound images of the heart are evaluated at the time of generation. Patients who are unable to exercise are administered a drug called Dobutamine, in place of treadmill testing. It increases the heart rate and blood pressure to help diagnose and evaluate coronary artery disease. The exercise stress test is more common and it requires the individual to be hooked up to multiple lead EKGs and to exercise on a treadmill in order to record electrical activity of the heart during exercise. Stress tests can also be done in conjunction with nuclear medicine and ultrasound. Electrical impulses and the rhythms of the heart are recorded over a 24-hour period. Holter monitors require the placement of a number of leads on the chest, connected to a box that is carried around the waist or over the shoulder of the patient. Examination of the blood vessels (of heart, brain, kidney) from femoral artery using X-rays following the injection of a radiopaque substance that does not allow the passage of X-ray or other forms of radiation, is conducted in this form of treatment. The repair of a blood vessel, either by inserting a balloon-tipped catheter to unblock it, or by reconstructing or replacing part of the vessel is done in angioplasty. A heart procedure called stenting may be combined along with angioplasties. A stent is a small, wire-mesh tube that is inserted into a blood vessel to hold it open. After the stent is inserted, it becomes a permanent part of the artery wall, strengthening the wall while keeping the artery open for blood flow to the heart muscle. Medicated stents are called drug-eluting stents and help in preventing restenosis or closure. Balloon valvuloplasty or percutaneous balloon valvuloplasty, is a surgical procedure used to open a narrowed heart valve and is at times referred to as balloon enlargement of a narrowed heart valve. There are four valves in the heart - aortic valve, pulmonary valve, mitral valve and tricuspid valve - each at the exit of one of the heart's four chambers. These valves open and close to regulate the blood flow from one chamber to the next and are vital to the efficient functioning of the heart and circulatory system. Balloon valvuloplasty is used primarily to treat pulmonary, mitral and aortic valves when narrowing is present and medical treatment has not corrected or relieved the related problems. Valvuloplasty is recommended for those patients whose symptoms continue to progress even after medication has been administered for a period of time. Atherectomy is the process of cutting the blockage from within the coronary arteries with the help of special devices. Heart blockages that are very hard and calcified and do not open up properly with a balloon or a stent may need rotational atherectomy (rotablator) to remove the hard blockage so that they can open up easily with a stent. Blockages at origin of big arteries may need to be taken out by a device called directional atherectomy. The team leaders are renowned internationally for their expertise in these techniques, which have very few experts. In fact, our team leaders have trained numerous physicians in the Asia-Pacific region to perform these techniques over the last 15 years. IVUS is an invasive procedure, performed along with cardiac catheterisation. A miniature transducer and a coronary catheter is introduced in the coronary arteries. High frequency sound waves produce detailed images of the arteries. The Clearview IVUS is the latest generation available in a few centres across Asia-Pacific region. Our team leaders are renowned experts in performing this procedure. The surgical removal of a blood clot (thrombus) from a blood vessel is called thrombectomy. Our team leaders are one of the few people in the country who are trained and acclaimed for their expertise in treatment of aneurysms and dissection by stent grafts non-operatively. By thrombectomy, rotarcx and lysis. Paediatric cardiologists repair some congenital heart defects using miniature tools through flexible tubes called cardiac catheters. The catheter is inserted into a tiny incision in the groin or neck and then threaded through the arteries to the heart. In this procedure, radio wave energy is used to burn a tiny hole in the blocked valve. Another catheter, tipped with a tiny balloon, is slipped across the opening and inflated to open the valve, completely. This procedure is used to treat pulmonary valve stenosis. Pulmonary valve stenosis is narrowing of the pulmonary valve in the heart. It is usually congenital. Balloon dilatation is a minimally invasive transvenous procedure to dilate the pulmonary valve orifice during cardiac catheterisation. People with coarctation of the aorta (localised narrowing of the aorta) may be candidates for a cardiac catheterisation procedure. In this procedure a device is placed into the area of coarctation and is inflated to open the narrowed area, as an alternative to surgery. In addition, a small metal tube called a stent may also be placed in the narrowed area after the balloon dilation to keep it open. This is useful for patients who cannot undergo open-heart surgery due to failing health. Electrophysiology involves measurements of voltage change or electrical current flow on a wide variety of scales from single ion channel proteins to whole tissues like the heart. The study helps to determine whether the patient requires pacemaker, ICD, ablation or treatment through medicines only. Radio frequency ablation is a non-surgical procedure used to treat some types of rapid heart beats and uncoordinated heartbeats. It destroys or ablates the tissues that are causing rhythm disturbances. It removes the focus of arrhythmias or unwanted electrical connections in the heart. Artificial pacemaker may be implanted to provide proper heart rhythm when the body's natural pacemaker does not function properly. The biventricular pacemaker synchronises the heart's two lower chambersk, the ventricles, to improve pumping efficiency and relieve the symptoms of congestive heart failure. Implantable Cardioverter Defibrillators (ICDs) are used to treat heart rhythms that are abnormally fast or irregular heart rhythms (arrhythmias) and life threatening. ICDs have been found to reduce the SCD (Sudden Cardiac Death) mortality rate when compared with conventional treatment. One dedicated nurse assigned to each bed for uninterrupted care. More than 50 beds dedicated to advanced coronary care, post-angioplasty care and post-surgical care. 24-hour on-site cardiologist consultation as well as management of all cardiac emergencies including Acute MI's. Next-generation 'Apex Coronary Care Unit' offering intensive care services to patients, round-the-clock, by a team that is exclusively dedicated to the unit. An experienced, highly trained, multi-disciplinary team of physicians, nurses and paramedical professionals with expertise in the field of cardiology, intensive care, respiratory medicine and anaesthesiology. A sophisticated control command centre ensures instantaneous response to the patient's needs. Can be used for diagnosis of coronary artery disease, viable mycardium, etc. Fully equipped with state-of-the-art variable angle dual head gamma camera, interfaced with a sophisticated processing station, along with the latest hardware & software. Accurate analysis of scans, using high resolution three-dimensional functional image processing and co-registration with anatomical images, provided by a high-end CT in a short time. Equipped with the 'Brilliance 64-channel' configuration, one of the few in the Asia-Pacific region. Provides unprecedented performance in cardiac and coronary artery imaging, pulmonary studies, CTA and critical care, exemplifying a new realm of possibilities and patient care. Expands clinical boundaries through applications such as extended coverage brain perfusion that positions CT scan as a modality of choice in stroke evaluation.